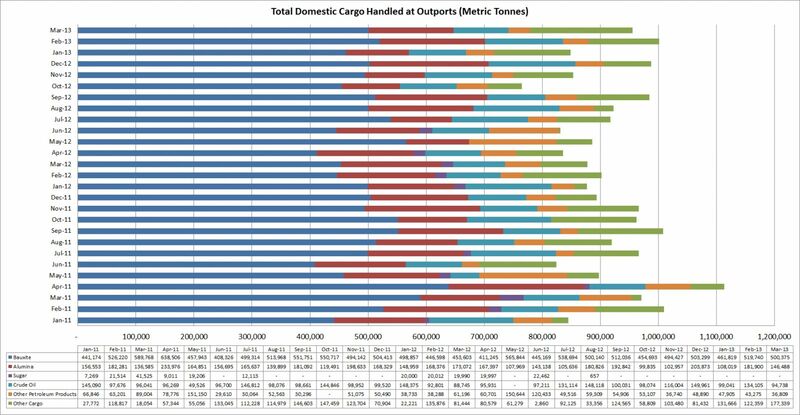 The Image shows breakdown of monthly outport cargo data from January 2011 to March 2013. Click on the Image to enlarge. For the Motion Chart, click on the circle that you would like to track on the motion chart before pressing play to begin the animation. This will allow you to track the change in cargo handled over time. Outports handle all types of goods including imports and exports. These are all goods-related ports and do not include cruise ship ports. Some of these ports include the Port of Montego Bay, the Reynolds Pier in Ocho Rios, Port Esquivel, Rocky Point, Port Rhoades, Port Kaiser and Rio Bueno, but there are others that receive ships occasionally. "Domestic Cargo – Cargo of national origin or destination for national use"